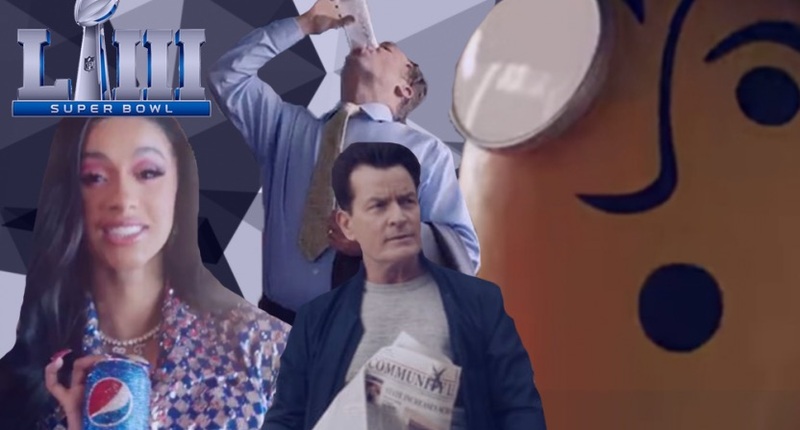 It’s not just the Patriots and the Rams that are competing for supremacy on Super Bowl night; sponsors are also putting their best foot forward in the advertising competition. To check out our rundown of the most notable, memorable, heartwarming, humorous or ridiculously lame commercials from Super Bowl LIII, scroll through our gallery. Mermaid entrepreneurs with heads for business, and tail fins for navigating a real-life “Shark Tank,” star in this cute commercial for spiked seltzer that is kept afloat by good visual effects and sound design. Agency: Bullish. Not “great”? Not “delicious”? Just “OK”? Fine. Pepsi might be OK with selling its beverage as “OK,” repeatedly, but with such enthusiastic pitchmen and -women as Steve Carrell, Lil Jon and Cardi B, we almost believe that it’s a greater compliment than it sounds. Carrell’s buoyant energy carries the commercial and lifts it, like a shooting star. Agency: Goodby, Silverstein & Partners. Pepsi’s sparking water, Bubly, has an almost-namesake for its brand spokesperson in singer Michael Bublé (eh, close enough). Points to the sound person who got the sharpie’s squeaks just right, but if you’re going to hire a singer for a commercial, could it have hurt you to have him sing?Agency: Goodby, Silverstein & Partners. M&Ms candy, which had one of last year’s worst ads (Danny De Vito as a human M&M demanding that people eat him), this year brings us a more palatable one, with Christina Applegate as a harried driver threatening her backseat passengers. Anyone with kids has been there, done that. Agency: BBDO New York. Of course, Doritos’ Flamin’ Hot Nacho flavor chips would be so hot they’d produce a fever dream for Chance the Rapper, resulting in Technicolor flop sweats and a dance-off with a ’90s boy band. Not much happens of note, but we see some cool hot rods, and a hot jet, along with a remix of a song that will at the very least rack up some royalties for the songwriters of “I Want It That Way.” Agency: Goodby, Silverstein & Partners.